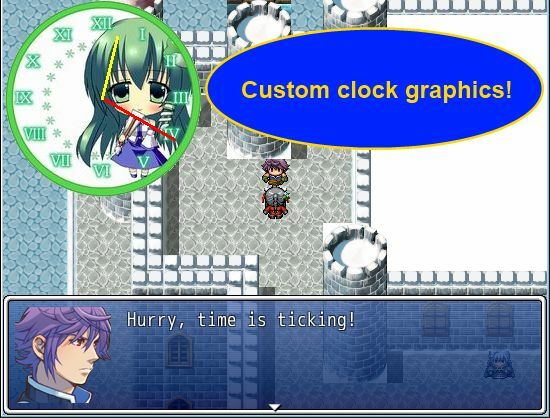 This script replaces the default timer sprite with a custom clock picture of your choice. It might look better. Add any clock images to your Graphics/System folder. In the configuration below, specify the filename of the picture to use for the clock. The clock should be a perfect circle with the hands extending from the center. The clock hands are drawn automatically and are scaled to the size of the image. You can specify the origin of the clock, which is the position of the upper-left corner, if you wish to move where the clock will be displayed. You can also specify the colors of each hand. It’s possible to show the clock with the Vlue’s Basic Real Time script? This script only replaces the game timer. Or when you use a key item ? Since the clock replaces the default timer sprite, it shows up automatically whenever you start the clock using a “control timer” event command.